Today is, a day celebrating the formation of the state in 1956. 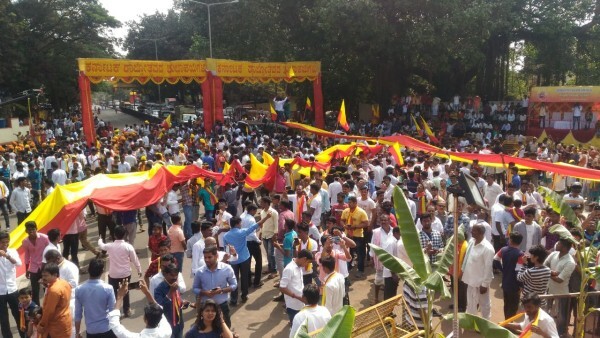 Lakhs of people throng the city for Karnataka Rajyotsava Day, which saw a colourful procession with tableaux from different parts of the city and organization makes its way through the streets starting 11 am from the C.P.Ed grounds, Kaktives, Ganpat Galli, Maruti Galli, Kirloskar Road and College Road. 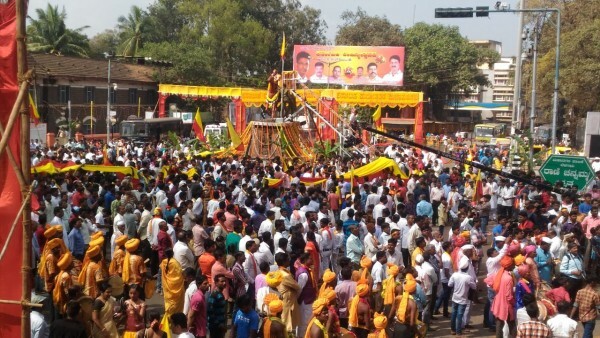 Rajyotsava in Belagavi is always special and grand compared to other parts of the state, with thousands of Kannada lovers from all age groups dancing to Kannada tunes in a grand procession. The city itself was itself decked like a bride for the grand celebrations. Representatives of all Kannada organisations in the state participated in the procession. The Rani Chennama Circle is thronged with thousands of people and Sound of DJ is making everyone dance to its tunes. Infact as early as 3 AM some DJ started playing loud music in Shahpur. Considering the excitement among Kannada workers, the district administration will arrange a helicopter to shower flowers on the procession. ಎಲ್ಲರಿಗು ಕನ್ನಡ ರಾಜ್ಯೋತ್ಸವ ಹಾರ್ದಿಕ ಶುಭಾಶಯಗಳು..
Karnataka Rajyotsavada haardika shubhashayagalu friends..
GRAND WISHES OF KARNATAKA RAJYOTSAVA TO ALL.